Organisations all over the world recognise Microsoft Azure over Amazon Web Services (AWS) as the most trusted cloud for enterprise and hybrid infrastructure. Use your existing Windows Server and SQL Server licences with Software Assurance to pay a reduced rate when you move to Azure. Get three additional years of security updates for free when you move your Windows Server or SQL Server 2008 and 2008 R2 workloads to Azure. Businesses and organisations around the world – small and large, old and new – rely on Azure to provide trusted cloud services. Use the OS, languages and open-source tools of your choice on Azure. It’s the only cloud with integrated support for RedHat and the cloud that had the most contributions to GitHub in 2017. Extend your organisation’s existing knowledge and a consistent experience across your on-premises and cloud technologies through full integration with Office 365 and Active Directory. Compare AWS and Azure, and you’ll find that Azure has the most comprehensive set of compliance offerings of any cloud service provider. Take advantage of the most global regions of any public cloud to help ensure compliance with data residency requirements. Reduce risk and exposure to intellectual property legal action with comprehensive IP protection. Microsoft has extensive expertise in protecting data, championing privacy and complying with complex regulations, and currently complies with both EU-US Privacy Shield and EU Model Clauses. We believe that the General Data Protection Regulation (GDPR) is an important step forwards for clarifying and enabling individual privacy rights. We want to help you focus on your core business while efficiently preparing for the GDPR. We are committed to GDPR compliance across our cloud services and provide GDPR-related assurances in our contractual commitments. 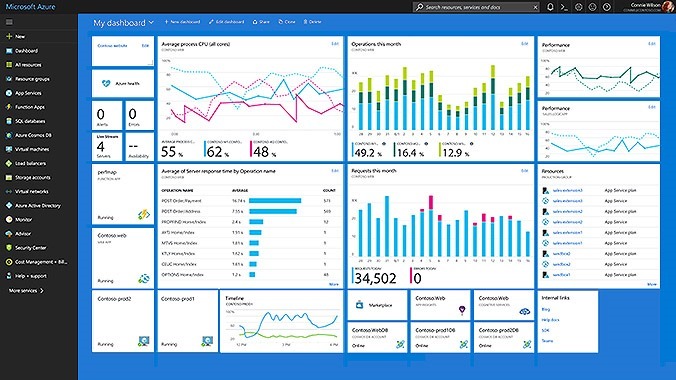 Gain unparalleled productivity with end-to-end development and management tools to monitor, manage and protect your cloud resources – tools that are only available on Azure – and use any of the development tools and languages you already know. Take advantage of the industry’s most innovative container offerings and more than 100 services that accelerate your ability to innovate. Help reduce risk and complexity with the only hybrid cloud for building and deploying solutions with true consistency across your entire technology stack. Give users a consistent experience with a common identity and get a holistic view that enables you to optimise and help secure your hybrid infrastructure – capabilities that no other cloud offers. Develop breakthrough apps with built-in intelligence capabilities that you’ll only find with Azure. Build and deploy custom artificial intelligence (AI) models at scale. Expand your capabilities with AI services that make it easy to deploy intelligence at the edge. With the most global regions of any cloud provider, Azure offers the scale you need to bring your applications close to your users around the world. If you are a retailer, you have important reasons to consider whether you should place your critical business applications and data with AWS. Many large retailers have already moved away from using AWS. As Amazon continues to extend its reach into other sectors, including grocery, package delivery and healthcare, there is potential for it to compete directly against many of its AWS customers. Azure is focused on empowering customers to achieve more with new, innovative services that support your business. By providing industry-leading benefits such as Azure IP Advantage and the Microsoft Shared Innovation Initiative, Azure helps ensure that your intellectual property and investments in innovation are protected.